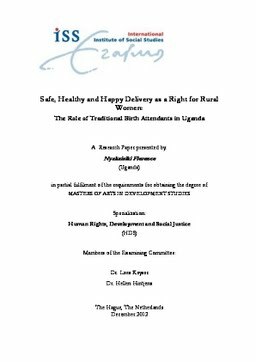 This study will highlight the fundamental contributions of TBAs towards rural women in Mpigi district of Uganda, to attaining a safe, healthy and happy delivery as women’s basic right, as specified in the Constitution of the Republic of Uganda and other international human rights instruments. The study investigates reasons why rural mothers continue to seek TBAs services, explores perceptions of health workers and of rural mothers towards TBAs’ services. It also considers some of the risks for rural mothers associated with TBAs’ services. The study will be significant in informing the state, policy makers and other stakeholders who are involved in designing interventions to provide and improve maternal health care services in Uganda. This study questions the priority of government to phase out TBAs, suggesting that this may not automatically improve maternal health. One key finding is that an important first step is to legalize, register, monitor and also train TBAs in order to achieve minimum health standards.